So now the payoff: What did we get for our gardening efforts under 100 Watts of CFL lighting? 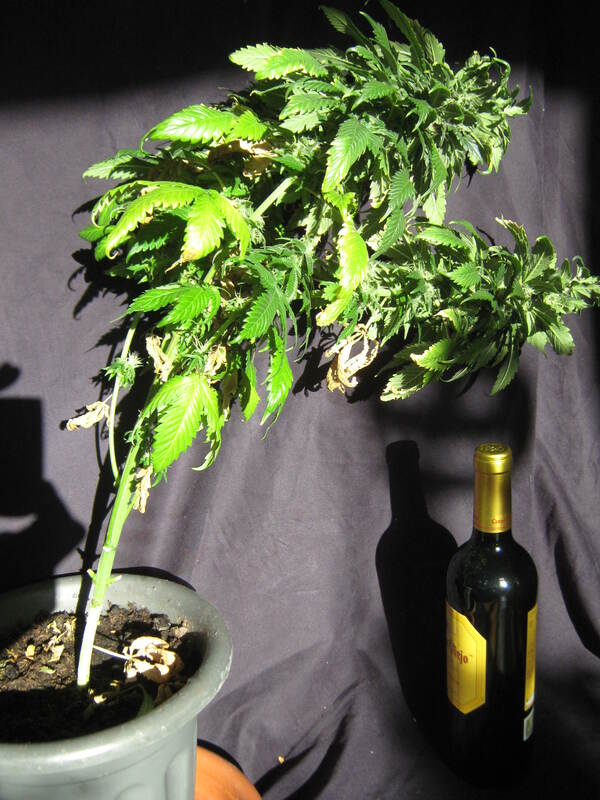 In the above picture, you can see that the Dinafem Critical+ plant was literally drooping over from the weight of the maturing buds. I’ve placed a bottle of wine next to the plant for scale. 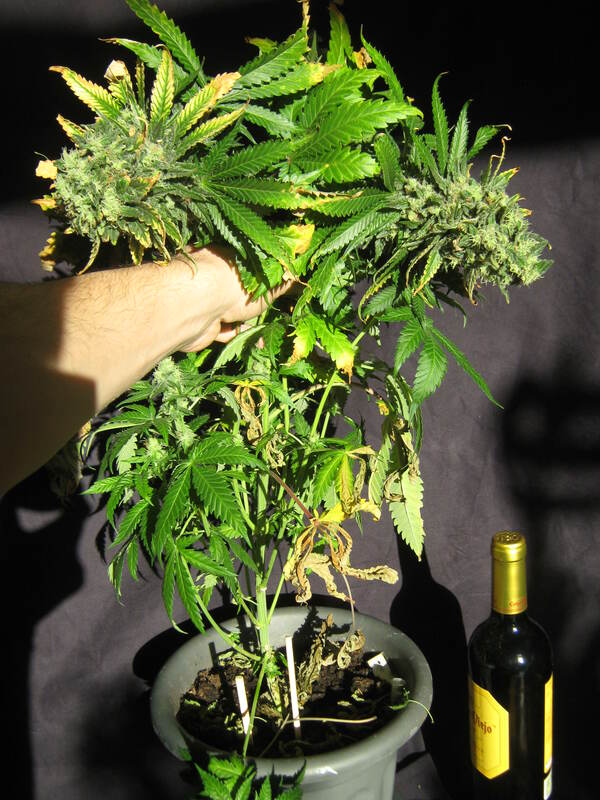 As you can see, some of the untrimmed buds had nearly the circumference of a wine bottle! I am thoroughly impressed with the performance of this strain under these humble lighting conditions, and would certainly recommend it to home growers. Critical + 100 Watt CFL grow buds – fully trimmed. 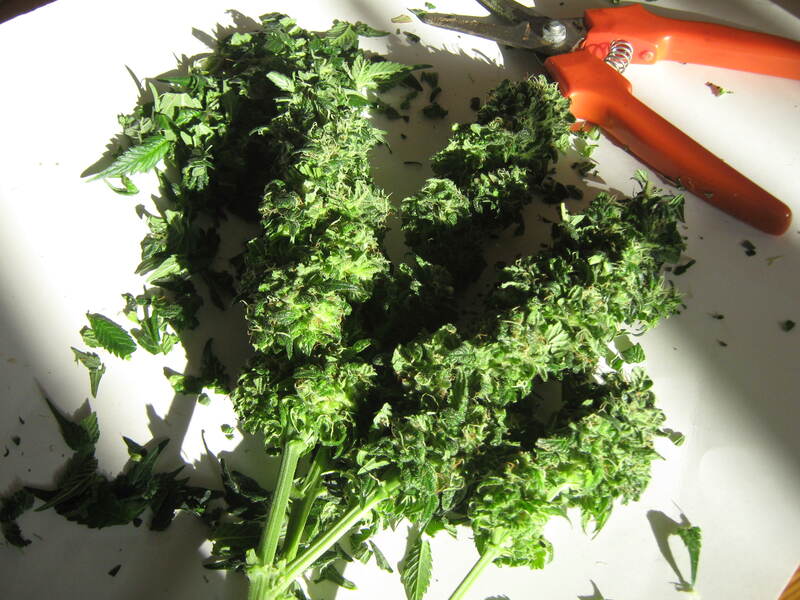 The dried weight of the large buds harvested from this plant: 21 grams (3/4 of an ounce). It’s important to note that I quite liberally trimmed away smaller buds and “sugar leaves”, drying them separately in a large paper bag. The combined (quality) dried trim weighed in at 16 grams (a bit over a half of an ounce). Afghan Kush / Double Gum cross – ready for harvest. Afghan Kush / Double Gum cross , main buds trimmed. This plant produced an unusually strong aroma of coffee through the last weeks of flowering. Now that the buds have dried, the earthy, roasted smell of coffee has taken on an undertone of fruity bubble gum, much like the father plant. Stay tuned for upcoming smoke reports for both plants along with some closeups of the cured buds. The yield from this plant in dried buds was just over 13 grams (just under 1/2 ounce). 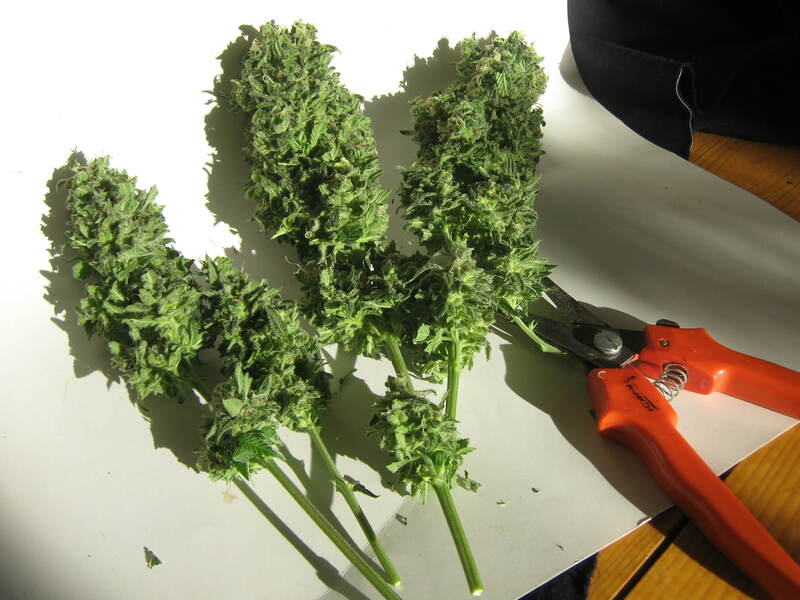 This puts the total harvest (including the smaller buds and good quality trim) at 50 grams (1 3/4 ounces). Now, I’ll go out on a *drooping* limb, and say that this is quality marijuana. Check your local prices for good quality, organically grown cannabis. Prices vary wildly from place to place, but an ounce of good grass is never cheap. Factor in that you can control your own grow and know what you’re feeding those plants, and a 100Watt CFL grow makes a lot of sense. You can of course up the ante and increase your lighting wattage, and you’ll produce a lot more per plant! However, this grow was meant to show that with the right know-how, you can produce a fine stash for your personal use in just a few months time. Pick up our Ebook on growing your own at home, and you’ll be on your way to results just like you’ve seen here using a simple setup, and much more if you’re aiming high, so to speak. I’ll be back soon with smoke reports when the harvest has cured properly. Tags: 100 watt grow seedlings, 100 watt grow yield?, are CFL buds any good?, buds from CFL grow, CFL grow oounces, CFL grow yield, how much bud from 100watt grow? Not a fan of Dinafem. My experiences with their seeds have never been positive and I generally have a dim view of seed banks. I much prefer to sprout a dozen bagseed to find one good plant rather than pay $200 for someone’s allegedly good genetics and still only get one decent plant out of a dozen. Once you get 2 or 3 good females, you can clone or just keep revegging them for years. I have gotten plants out of bagseed that would put these puny little runts to shame (Taste and potency both), under the same light! Of course, growing one huge monster is always more efficient than growing two runts. Though this comment is old, its a very repugnant statement to make for an apparent new grower on a small budget. Him being a new grower, he’s not in the stage where he should be attempting to clone a plant he knows little about, he has skill he must obtain in the “growth” department before he can proceed to gathering knowledge in the “development” department. Also, Look at the strains he has selected- they have short flowering times resembling that of autoflowering plants. To find genetics with such short flowering times is a very difficult task from bag seed and would require multiple “bags” containing different strains with seeds in each bag. (otherwise your just just Pheno-hunting) and the size constraints of his grow room play a large factor in the amount of plants that can be maintained . Hey GP any way I can email you. Mentor me on my first couple grows.